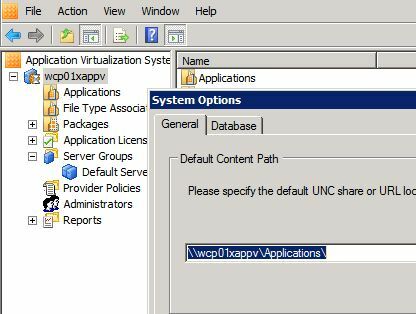 After installing APP-V server and setting up the default application to send out to clients the clients received the 4605F3-1690140A-20000194 error and it was seen on the client PC after launching a virtualized application. “Package file not found: F:\APP-V Data\DefaultApp\DefaultApp.sft. 4. Make sure the permissions on the directory are set correclty. If the App-V Service is running under LOCAL SYSTEM apply full access to the computer name. If the Account is running under NETWORK SERVICE apply full access to NETWORK SERVICE built in name. 5. Make sure the Share Permissions are configured the same as the directory permissions. I have another issue on a LWS server. When I give the HWS server path to load the OSD and the ICO files, no problem, it’s working, I changed the ASR in the client to stream the SFT in the LWS server, and is working, but when I change the OSR and the ISR, the software didn’t appear in the applications pane of the client. It’s rather stupid that this happens to me all the time with the default app. Every app I add myself works like a charm. Why doesn’t the installer by default set the content share UNC path, it’s just so stupid. That default app is configured in just about every wrong way that is possible. Is that meant to be a challenge or what?